Jackson County has some of the finest lake fishing opportunities in the state. Our scenic mountain lakes offer any fisherman a day full of tight lines and fun in the sun. Please click HERE for a copy of our lake fishing brochure. In 1941 Nantahala Power & Light completed a hydro-electric dam on the headwaters of the Tuckaseigee River, flooding the small town of Glenville and forming Lake Glenville. At an elevation of 3,494 ft. above sea level, Lake Glenville has the highest elevation of any lake east of the Mississippi River. Lake Glenville is a well kept secret in the mountains of Western NC. The fishing is incredible both for quantity and quality. 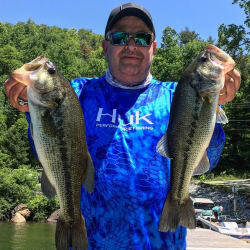 Largemouth Bass and Smallmouth Bass are the common species found at Lake Glenville. Lake Glenville's abundance of blueback herring and bream are the main food sources for the predatory fish. There are two paved public access ramps, with plenty of parking. Public access is at Pine Creek Road, which intersects with NC 107 a mile or so north of the Glenville Post Office. In the mid 1950’s Nantahala Power and Light built 4 small dams on the east fork of the Tuckaseigee River to provide more hydro-electric power. This created a chain of four small, but prestigious lakes. The largest of these lakes is Bear Lake, located 5.1 miles east of Tuckasegee off NC 281 (Canada Road). Turn left onto NC 281 and continue just over 5 miles before turning right at the public access sign. The road to the ramp is a very good gravel road that winds easily down to the gravel parking area at the ramp. The lake itself boasts 476 acres of water and 13.5 miles of shore line. Largemouth Bass, Smallmouth Bass and Walleye are species commonly caught here. Big largemouth rule these waters and can be caught shallow and deep! With Bear Creek being pretty remote, the lake does not get a lot of heavy pressure. The quantity is not the greatest but the quality is always something to brag about! Wolf Lake is the second largest lake on the east fork of the Tuckasegee; however, because it is off the beaten path, it is typically very peaceful. South of Sylva, and east of the town of Tuckasegee on State Highway 281(Canada Road), Wolf Lake is 183 acres in size with a mere 6.9 miles of shoreline. This lake is not quite as deep as Bear Lake and the water tends to be a bit more cloudy, due to algae , but lure visibility is typically good at 9 to 10 feet. At the junction of NC 107/NC 281 turn left on NC 281 South (Canada Road), and continue about 13 miles. The parking area and public access is on the left, just before the 140- foot dam, which the highway crosses. You can typically pull trout, small & red-eyed bass as well as walleye from this lake. At the eastern most point on Hwy 281 (Canada Road), sits the smallest lake in this chain of four, Tanasee Creek Lake. This lake is only 39 acres. Due to the small size you can not get a big motor boat on the lake, but you can get a small “john boat,” or try your hand at a canoe or kayak. The public access point is off NC 281 near where Tanasee Creek enters the lake. There is a small concrete launch ramp and a gravel parking area. The trip up the mountain is quiet impressive. Tanasee Creek Lake is hatchery supported and there are several areas around the lake where you can fish from the bank. Although Cedar Cliff is not a very large lake, weighing in at 121 acres of water and 4.5 miles of shoreline, this little lake holds many big surprises. Cedar Cliff contains small mouth, trout and walleye, however it also contains large-mouth bass, which are much harder to catch. The population of largemouth are small both in density and size, but, there are definitely large mouth in these waters. Cedar Cliff is the only lake in the chain of four that is not hatchery supported. Cross the bridge just past the NC 107/NC 281 intersection and turn left onto Shook Cove Road (SR 1135). The public access area is well marked and located about 2 miles out. For a list of chamber member fishing guides, please click HERE.